Living on Martha’s Vineyard we may get spoiled with many things, but inexpensive and appetizing Chinese food is definitely not one of them. I think more Islander’s go to Peeking Palace in Falmouth then people who are actually from Falmouth. The old, nostalgic Chinese take-out places are sadly becoming a thing of the past. Mee-Sum is one of those places that’s still left. Mee-Sum in snuggled on South Main Street in the quaint little ocean-view pot hole ridden community of Fall River. There were three places to go for Chinese in Fall River when I was a kid. China Royal, Mark You, and Mee-Sum. Many memories were made in the China Royal Dining Room (D4 with Chicken Fingers), and Mark You was my family’s go to place for takeout. On a recent trip home I decided I have to have some old time Chinese food and took Renee to Mee-Sum. Thing’s haven’t changed in that place in probably thirty years. And that’s a good thing! 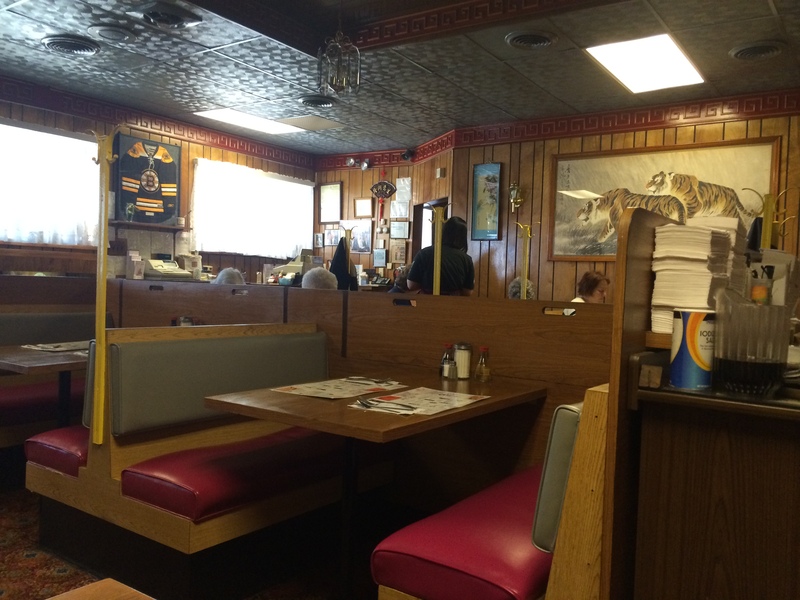 The dining room still has the old style booths that can bring you back to your childhood. I can remember going into Mark-You booths begging my dad for a nickel so I could play a song that you could hardly make out the words when it played. No fancy table cloths or sushi here. By at least twenty years were the youngest people in the restaurant. We ordered a pu-pu platter, an order a Chicken Chow Mein (Strained because I don’t like onions) and an order of Fried Rice. Pleanty of food for two with some to take home. I had to get my fill because who knows next week this place could close it’s doors for all I know. The waitress looked like she was plucked right out of the heart of the city and did her job well. The food came and it was just like I remembered. It hasn’t changed a bit. If you haven’t had Fall River chow mein you are missing out. 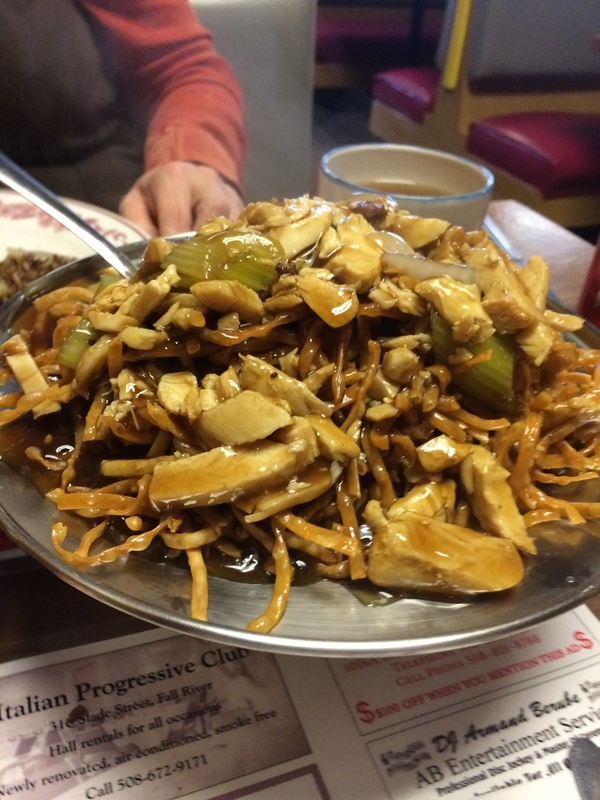 Fall River Chow Mein is different from Boston, Falmouth, or anywhere else you can think of. I don’t even think you can get Fall River chow mein in China. Fall River chow mein is pretty simple. It’s fried noodles with gravy on top. You can get chicken, shrimp, beef, pork, etc on it. Normally it’s served with onions and celery. The key is that the gravy and the noodles are only put together when they are served as to not make the noodles soggy. I load mine up with vinegar, salt and some duck sauce. Chow Mein Sandwiches are very popular in Fall River also. Mee-Sum did not disappoint. 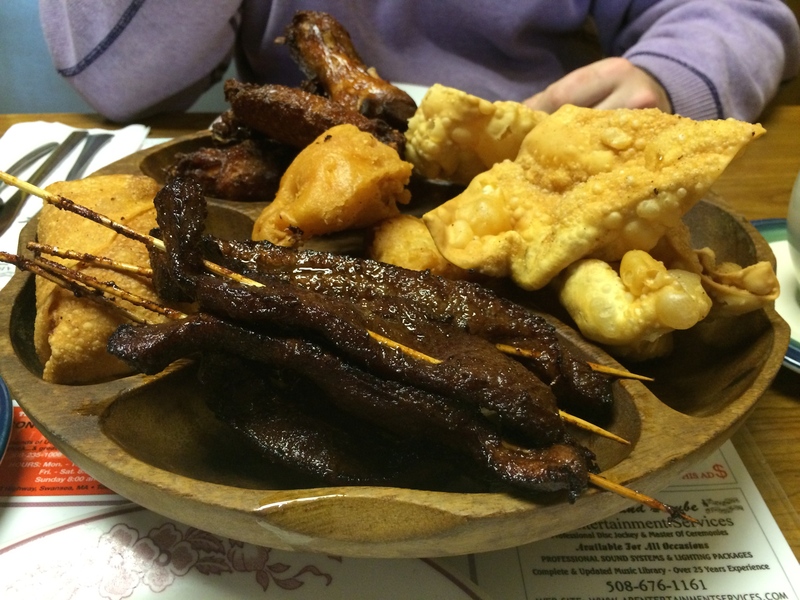 The pu-pu platter was great and consisted of chicken wings, two egg rolls, beef teriyaki, crab Rangoos, and a couple of Fried Shrimp. The Chow Mein was awesome and fried rice was great. The beef teriyaki was actual thick and tasty meat that was cooked just right. So often beef teriyaki comes and it’s so chewy you can’t get it off the stick without cracking a tooth. Everything was just as I remembered and was hoping for. They haven’t changed a thing! It brought back nostalgic memories of childhood and growing up in Fall River. I think the bill was $32.00. We had soft drinks, chinese tea and enough to take home for another meal for both of us. Wish I had more. Next time you find yourself in the Fall River area go visit Mee-Sum while you still can ! Great review and makes me want to head there now! Since when does a Portugue get to critique Chinese food, and in New Bedford of all places? There’s no Linguicia or Kale soup served in a Chinese restaurant! Go figure!! Well done Food Gut! !